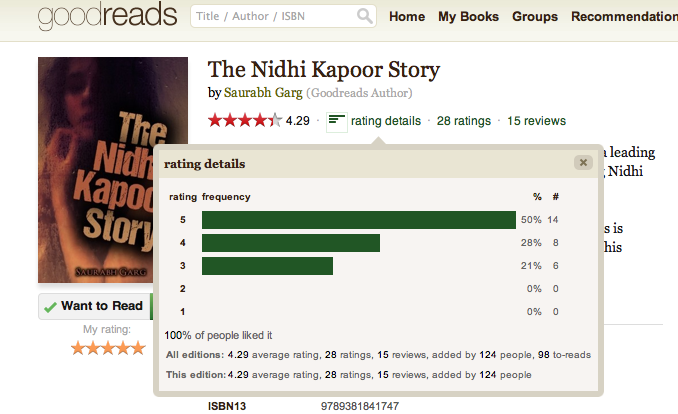 I just sold the first copy of The Nidhi Kapoor Story. And I am so thrilled about it. So thrilled that I am still shivering as I write this. It came as a surprise. At a moment when I wasn’t expecting it. At that moment I didn’t make a lot out of it. But after he left and reality hit home, I realized what he had done. It was amongst the best things that anyone has done for/to me. Ever. That time, I just said a meek thank you and left. But now, after all this time, I am speechless. It’s been some time and I still can’t think of a way to thank him for the gesture. Sir, if you are reading this, thank for buying the first copy. Thank you for the motivation and support. Thanks so much for your faith and confidence in me. Hope you like it when you read it.